"Hail, holy parent, who didst bring forth the King Who rules heaven and earth forever. My heart hath uttered a good word; I speak of my works for the King." By the visit of the Blessed Virgin John was sanctified in his mother's womb, and Elizabeth, enlightened by the Holy Ghost, knew, by the miraculous movements of her child, that Mary was the Mother of the Lord. Such effects did this visit produce. What would Jesus effect in us if we received Him with due preparation! Born to the wealthy nobility; her father was the prince of Camerino, Italy. Camilla early felt a call to the religious life, which her family initially opposed, hoping for a good marriage for her. She became a Poor Clare nun in Urbino, Italy at age 23. 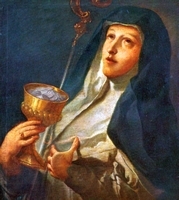 Abbess of the convent of Santa Maria Nuova at Camarino, Italy which her father had restored for her. In 1502 her father and brothers were all killed for political reasons. In 1505, Pope Julius II sent her to found a Poor Clare convent in Fermo, Italy. In 1521 she helped institute the rule of the Poor Clares in San Severino Marche, Italy. Visionary; the visions of angels helped her understand several theological concepts. Stigmatist. Born to the nobility, and an only child. His father died when James was very small, his mother left the family to become a Cistercian nun, and James was raised by his grandmother. Tutored by a Cistercian monk who taught the boy to meditate. When he came of age, he became a Dominican at Santa Maria Celeste in Venice, Italy. On his way to the monastery he gave away his money to the poor he met on the way, keeping only enough to buy books; on arrival, he found a lay-brother in need of clothes; he gave the man the rest of his money, and entered empty-handed. Dominican for 66 years, holding offices in several houses in and around Venice. When word got out about his gift for spiritual direction, he feared the notoriety, and tried to withdraw from public life, transferring to the house in Forli, Italy, a place noted for its poverty and strict observance. Worked with the sick, heard confessions by the hour, and gave away everything that came to hand. Noted healer with hundreds of miraculous cures attributed to his intervention. For centuries legend said she was the daughter of Saint Peter, and that she was so beautiful that he had locked her in a tower to keep her from eligible men, but none of that is true. She may have been related to Peter, a servant, a co-worker, one of his converts, his "spiritual daughter", or the tradition may have started because of the similarities of the names. May have been related to Saint Flavia Domitilla of Terracina. Cured of palsy by Saint Peter. 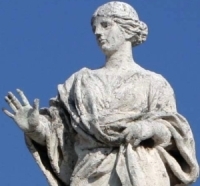 One story says she refused a marriage offer by a pagan king named Flaccus; when he pressed his case, she went on a hunger strike, and died three days later. Old inscriptions, however, list her as a martyr in the more common murdered-for-the-faith form. Orphaned as a child, he was raised by his grandmother. Convert to Catholicism. Studied at the diocesan seminary in Beijing, China, and was one of the first priest ordained there. 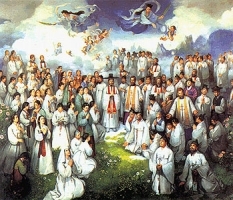 Christianity had taken root in Korea through the work of lay people who learned of the faith from books and letters written by missionaries to China. Father James was the first priest to enter the country, crossing the border on 24 December 1794. He studied Korean, and conducted his first Mass on Easter Sunday 1795. When the authorities learned of his presence, they began to hunt for him; he had been assisted in hiding out by Blessed Paulus Yun Yu-il, Blessed Matthaeus Choe In-gil, and Blessed Sabas Ji Hwang, all of whom were martyred for having helped him. Father James stayed on the move, ministering to covert Christians, compiling a catechism in Korea, organizing classes in Scripture and doctrine. Thousands were brought to the faith. In 1801 the government began arresting and torturing lay people to learn where Father James was hiding. To stop this abuse, Father James surrendered to the authorities on 11 March 1801. Over the next 10 weeks he was repeatedly interrogated and tortured, the authorities believing he was a spy, that Christianity was subversive, that he came with some evil intent. He talked of nothing but Christ. Martyr. Born to a poor but pious farm family, he worked as a shepherd on Mount Morrone until the age of 23. Joined the Franciscans in 1802 at the convent of Saint Nicholas in Arischia, Italy as a lay brother; he served as cook, gardener, woodworker and alms beggar for 12 years. Friar Minor at the Franciscan convent in Bellegra, Italy, outside Rome, in 1815. There he served over 50 years as porter, dispensing charity and aid to pilgrims and the poor. Known for great devotion to Our Lady, for his devotion to Eucharistic Adoration, and his complete poverty and disregard of worldly concerns for himself. With little education but much time in prayer, he became a spritual advisor to many. Educated by Jesuits. Joined the Minims of Saint Francis of Paola at age 19. Taught philosophy while still a deacon. Priest. Director of the library at the convent of Place Royale, Paris, France. Noted preacher. Falling ill, he was sent to the friary in Amiens, France, and then to Rouen, France. After much prayer and thought, Nicholas decided that a lack of education was behind most social evils as young people were unable to fit into society, and so he started an educational movement. Small general classes were begun in many parishes, and trade schools and apprentice programs soon developed. He helped found a community of men and women teachers dedicated to public education; these Charitable Teachers helped found several other groups with the same mission. Consulted several times by Saint John Baptist de la Salle who used Nicolas's thought when founding the Brothers of the Christian Schools. Noted spiritual director who taught an abandonment to faith. Founded Sisters of the Infant Jesus, Sisters of the Infant Jesus - Providence Sisters of Rouen, and Sisters of Providence of Lisieux. Born to the nobility, the daughter of Count Berthold and Sophie of Andechs; sister of Saint Euphemia of Altom?nster. Raised in a Benedictine convent at Diessen, Germany that had been founded by her parents. Benedictine nun. Abbess at Driessen and then of Edelstetten Abbey in 1153 where she was known as a reformer, mystic and miracle worker. Son of a shoemaker, he learned his father's trade. Pious, hard working youth. Orphan. At age 19 he tried to enter a Capuchin convent, but was turned away; he tried again; and again; and again. After eight years of pleading, he was admitted on 19 October 1743, taking the name Felix. For 40 years he served as a beggar for his house. Had a great devotion to the Blessed Sacrament. Had the gift of healing, both physical and spiritual, and of bilocation. Worked tirelessly with the sick during a plague epidemic in Cerami, Italy in March 1777, healing many and coming though it unharmed. He was so devoted to his obedience to his Order that he asked his guardian for permission to die. Following a wild and mis-spent youth, Vitalis had a conversion and sought to do penance first by going on pilgrimage to the most important shrines throughout Europe, and then by becoming a Benedictine monk at Monte Subasio in Umbria, Italy. Late in life he left community life to live as a barefoot hermit near Assisi, Italy; his only possession was a basket he used to fetch water. Known throughout the region for his piety and healing miracles, especially involving the urinary tract. Began studying at the English College in Rheims, France on 1 March 1583. Ordained in April 1585. Returned to England on 9 May 1585 to minister to covert Catholics in Yorkshire. Betrayed to a justice of the peace by some one who had seen him preparing palm fronds, he was arrested in bed in the early morning of Palm Sunday, 1591 for the crime of being a priest. Martyr. Member of the Ngabi clan. Convert. One of the Martyrs of Uganda who died in the Mwangan persecutions. Married layman and family man in the apostolic vicariate of England who provided aid to covert priests in the persecutions of Queen Elizabeth I. Martyr. Young layman in the diocese of Almeria Spain. Martyred in the Spanish Civil War. Premonstratensian monk. Canon of the monastery in Heylissem, Belgium. Spiritual director of the convent of Langwaden in Grevenbroich, Germany. Fourth bishop of Toulouse, France. Designed and began the construction of the first basilica in the diocese. Enshrined the relics of Saint Saturninus of Toulouse. Martyred in the persecutions of Hadrian. Camaldolese monk and priest in the abbey of Vangadizza (in modern Badia Polesine, Italy). Sixth century saint who lived in Cornwall. A church is dedicated to him, but no information about him has survived. One of the first members of the Cistercians. Monk. Abbot of the Vaucelles abbey. Professional soldier. Martyr. Mentioned prominently in Greek liturgy. Deacon in Rome, Italy. Wrote on theology. Fifth century bishop of Verona, Italy. Three young members of the imperial Roman nobility and who were raised in a palace and had Saint Protus of Aquileia as tutor and catechist. To escape the persecutions of Diocletian, the family sold their property and moved to Aquileia, Italy. However, the authorities there quickly ordered them to sacrifice to idols; they refused. Martyrs all - Cantianilla, Cantian and Cantius. Four Christians martyred together. No information about them has survived except their names - Justa, Lupus, Tertulla and Thecla.